(CNSNews.com) - Barack Obama was the first president of the United States to spend more on “means-tested entitlements”—AKA welfare—than on national defense, according to data published by his own Office of Management and Budget. In every year from fiscal 1962 through fiscal 2014, total national defense spending exceeded means-tested entitlement spending. In fiscal 2014, according to OMB Historical Table 3.2, “total national defense” spending was $603,457,000,000. That same year, according to OMB Historical Table 8.1, “means-tested entitlement” spending was $601,700,000,000. But in fiscal 2015, total national defense spending declined to $589,965,000,000 while means-tested entitlement spending climbed to $666,900,000,000. 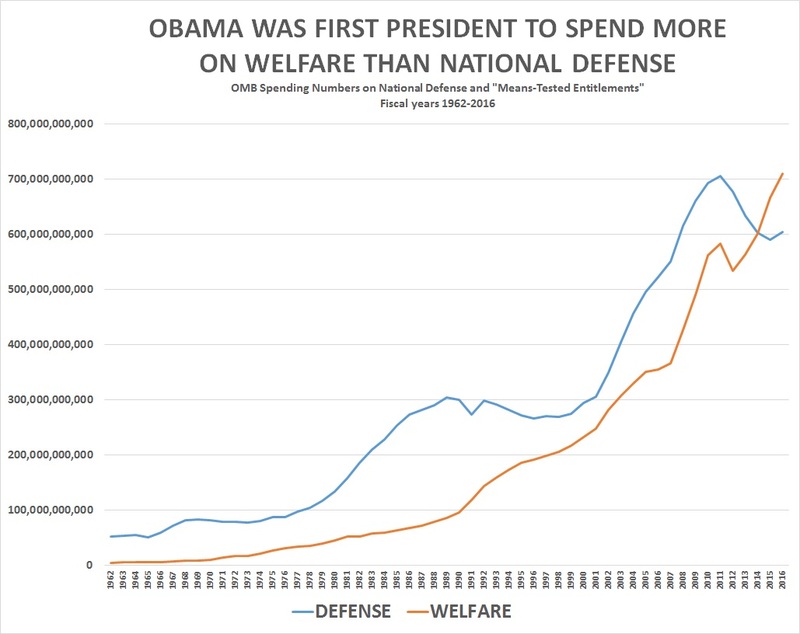 Thus, fiscal 2015 became the first year that means-tested entitlement spending—welfare spending--exceeded national defense spending. The fiscal 2016 numbers published in the OMB’s Historical Tables are estimates, but they show means-tested entitlements exceeding national defense spending $709,600,000,000 to $604,452,000,000. Among the 26 means-tested entitlement programs listed by the OMB are: food stamps, Medicaid, Temporary Assistance for Needy Families, the Supplemental Security Income program, refundable Earned Income Tax Credits. It also includes “Veterans’ Pensions benefits.” This programs is not counted as a part of category 050 national defense spending but category 700 veterans spending. “The Department of Veterans Affairs (VA) administers pension programs for certain low-income veterans and their surviving spouses and dependent children,” the Congressional Research Service explains. The Republicans now control both houses of Congress and the White House. Spending bills enacted in the current Congress will need to pass a Republican House, a Republican Senate and be signed by a Republican president.